I suppose when you get a 5 gallon metaframe tank for $4 I shouldn't be surprised that it has a few issues. I got the rust it used to have removed, sealed (or at least rust-o-leum-ed), and in doing so managed to crack one of the long panels of glass right near the bottom. I already knew the slate bottom couldn't hold water, but this was icing on the cake. And then I came here and had an idea. Plants that don't need to be in dirt or water! I need to find a better piece of wood for it, but I think it looks pretty nice like this. Any other ideas? Know a good place to get tillandsias? I've never seen a tank with a slate bottom! Thats awesome. I install slate on the back walls of most all my aquariums as a background. 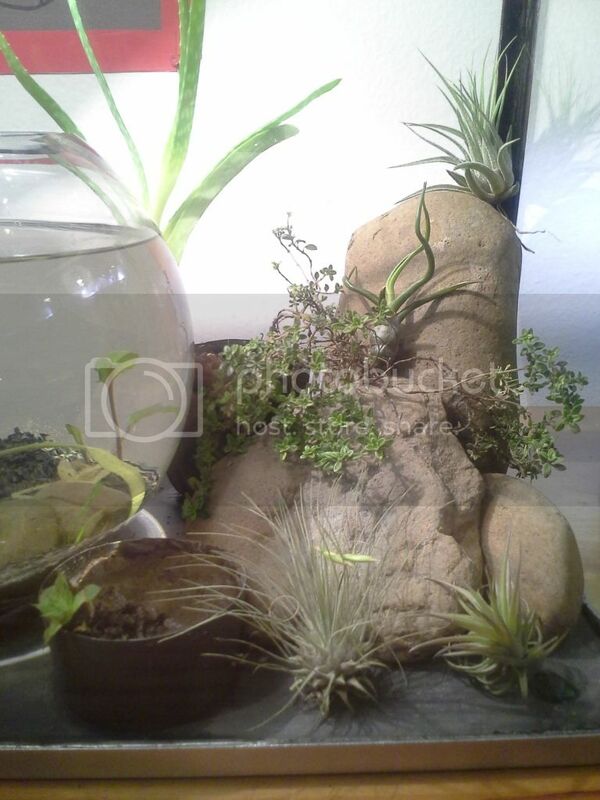 Black jungle supply offers many of them at a reasonable price as well as many other great terrarium plants. 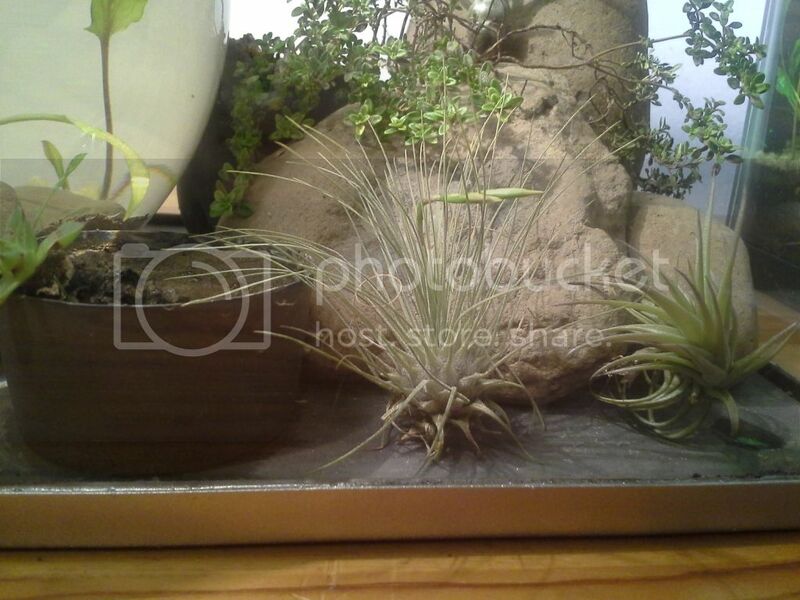 There are also if you search airplants on google many companys that sell them. Haven't tried them. The tillandsias I had from black jungle came in very healthy but my setups were all too humid for them and they quickly perished. Yeah, I'd never seen a tank like it before, but it seems they were produced in the 70-80's. The edges of the slate were sealed with some sort of tar stuff, since apparently silicone didn't/doesn't stick to slate. The tar was long gone by time I got it, and I was planning on having to add glass over the slate, but that seems like an awful lot of work now, hahaha. And thanks for that, I'll be checking that place out. Lol, I thought about doing that, but there was literally no tar left at all. It seems someone before me went and removed it (and probably wondered why it leaked afterwards). Thanks for the links! I love vertical tanks. 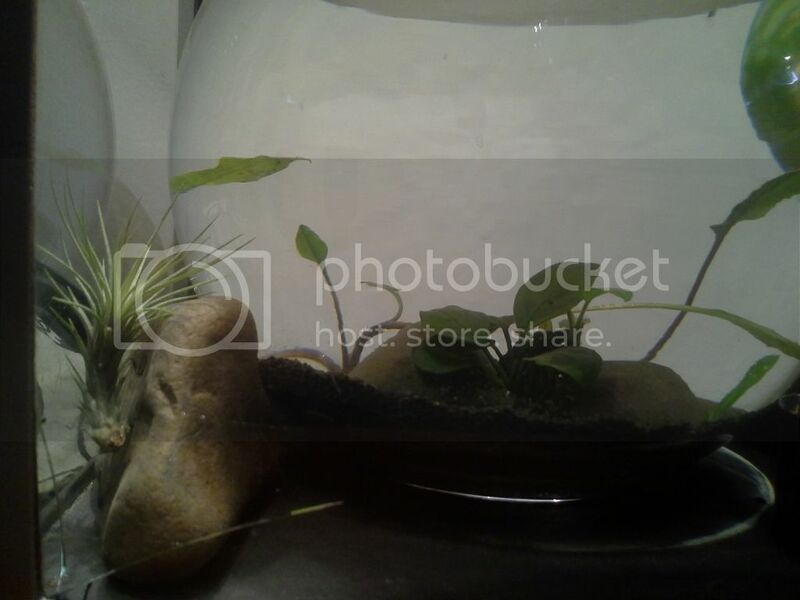 For a terrarium you should be able to just run some silicone over the crack and hide it below the substrate. Could do a nice pond in the front if you put glass across the front too. Would be great for tillandsia too.. Humid but not too much. 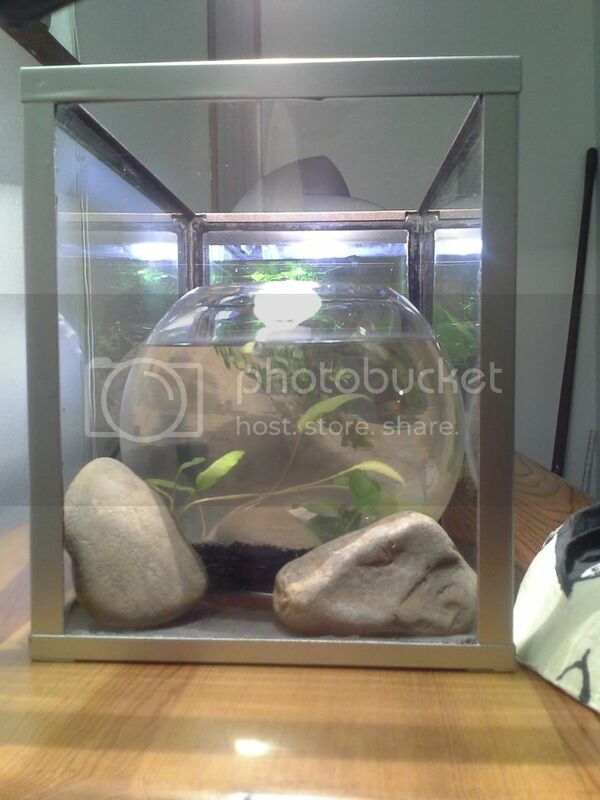 I don't know why, I'm just not feeling the terrarium thing. 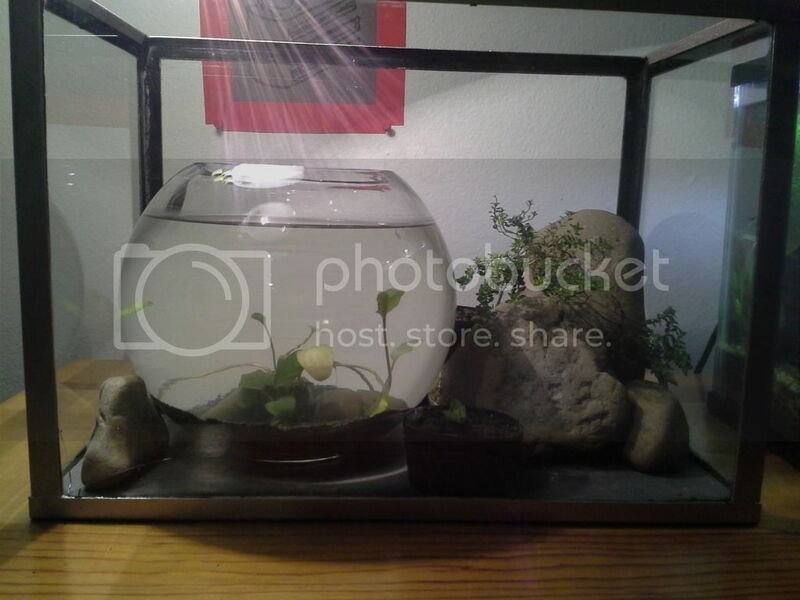 I know it could look good (actually one of my first thoughts for this tank), but it's just not appealing anymore. So I said I wouldn't have this set up like a normal tank (bottom down). Did that. Said I might not have a pond. Did that. Kinda. Now I have a planted tank in my not-yet-planted tank, so I can plant my tank while I plant my tank...d'oh. I ended up having to put the cracked side facing out, due to stains on the other side. Doesn't seem too noticeable. I really wish I had an erio or even a small piece of blyxia japonica, that would go so well with the tillies. I did order some, but no word on when they'll arrive. Also something to point out, I can't remove the bowl now that there's something in it. To get it in and out of the tank (thanks to the annoying metal frame) I have to put it entirely on its side. But anyways, opinions so far? I like it! Keep it updated! The dry with the wet, and used the same river rocks in both. The dry one does look a little odd without algae on the rocks...and it's kinda sad that I'm saying that. I may have to try growing moss to try and soften the rocks. 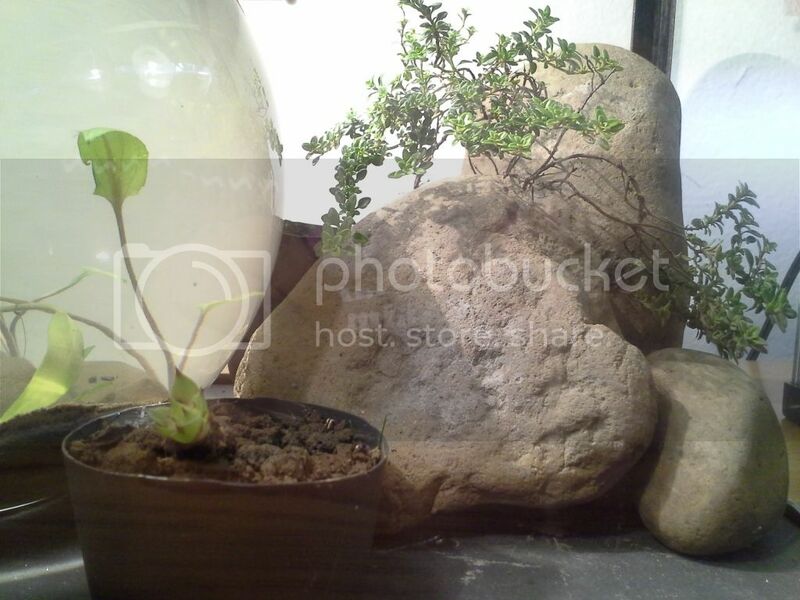 Finally got a couple terrestrial plants in, and I'd love to show you, but photobucket is down for the time being. I added a wee baby hen-and-chicks baby that wasn't doing too hot outside, and a branch of lemon thyme. I really love the thyme, it looks like sagebrush...and kinda like a cascading bonsai to me. Unfortunately, I don't know how well they'll do in the dirt they're in. It's really heavy clay soil that holds in water like mad, and can be very hard and tough... I may need to replant them into something a bit more friendly. Also, my tillandsias finally shipped! Unfortunately I might lose them all before I get them...very bad coordination of shipping time and a wood carving show I can't miss. Also, it's decided to be winter today. Snow and cold and sun, gotta love Eastern Washington. The plants come in on Saturday, I get back Sunday or Monday...place your bets now. Alright, photobucket is working now, so time for some new pics! have a different angle, this is the view from my recliner. The terrestrial plants are lemon thyme (smells so good!) and a itty bitty hen and chicks baby. Had to replant them for the second time today, and I tried to adjust their dirt to be a bit more root friendly...we'll see how it goes. Woo, got my tillies in! I don't know if they'll survive, as they spent 2 days in below freezing temps in a mailbox. They didn't look dead or even really beat up (freezing might have helped with that). I soaked them as directed, and they did look a bit better afterwards. If they don't make it, I do have another group on the way. They came with a list of names, but I haven't ID'ed most of the plants. I also added a lil baby aloe vera plant in the back with the thyme. 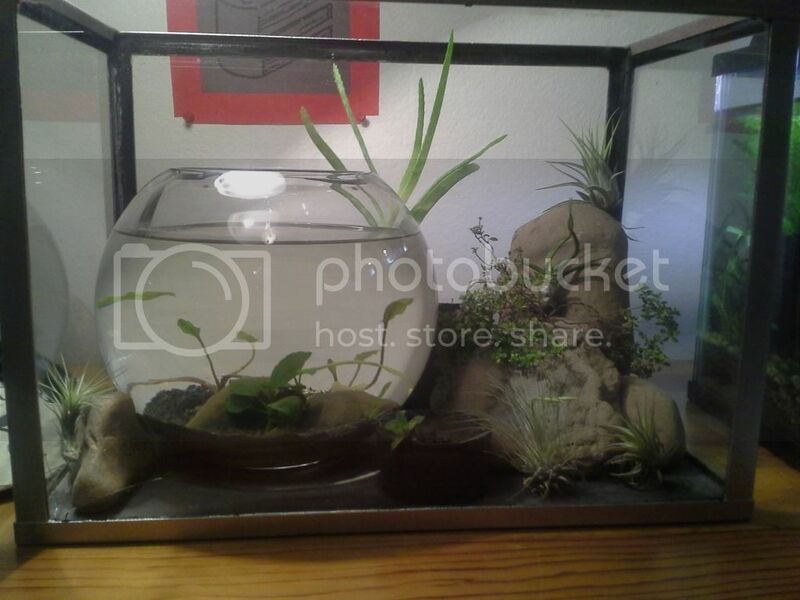 At last though, it looks like a full little terrarium, and only took a couple weeks, yay.